I like to cook and I like to eat and I like to think about cooking and eating. Sometimes friends will stop by and share their thoughts too. Nice to have you around. Continuing our Mother’s Day Month celebration with another guest post – this time, from my sister and all-around Super Mom, Sarah. She corrals her four kids with love and creativity, and she’s an inspirational mom to everyone who knows her. Fun fact: Strawberries were Sarah’s favorite fruit as far back as I can remember. Happy Mother’s Day, sis! Last year when my oldest daughter, Laurel, was starting first grade she was having a rough time with life. The previous year she had gone to a different school so she was starting all over again with new classmates and no best friend. It was then that she came home with a flyer from Scholastic in her backpack. This was one time she didn’t beg about it and so I flipped through the flyer when she wasn’t looking (didn’t want to get her hopes up). The book is Cook it Together by Annabel Karmel. The book describes the origins of different ingredients and follows up each description with a recipe or two you can make with the ingredient. We have used this book to get creative in the kitchen, making everything from homemade tomato soup to the most incredible Dark and White Chocolate Cakes you may ever try. I put the date and a summary of the recipe in the table of contents so we can keep track of how everything went and avoid expensive failures.If you are familiar with Scholastic Book Clubs, you will understand I was not looking for $8 cookbooks here! I was looking for a dollar book that would cheer up my sweetheart. But the $8 cookbook leapt out of the page at me and I bought it. I have never had such a successful purchase from Scholastic. 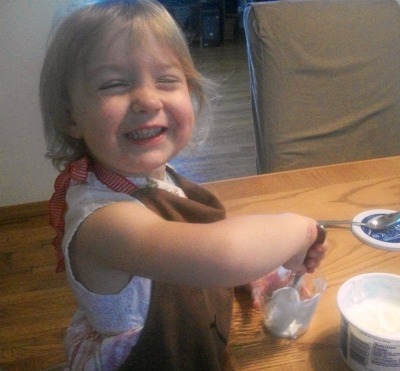 The most memorable recipe I modified to make with my toddlers and share with you. If you have kids I highly recommend buying this book or another kid’s recipe book to try cooking new things together. The best thing about purchasing this book (and not using the internet, or some library book) is continuing an activity that brings us together. Laurel felt special and loved. Proof to me is where I found the book when I wanted to write about it: It was by Laurel’s bed one and a half years later. 1. Wash and hull strawberries; save 4 of the nicest-looking strawberries as topping. 2. Put berries and sugar in a mixing bowl and mash with a potato masher until juicy but still chunky. 3. In the plastic cups, layer Greek yogurt and strawberry mixture. 4. 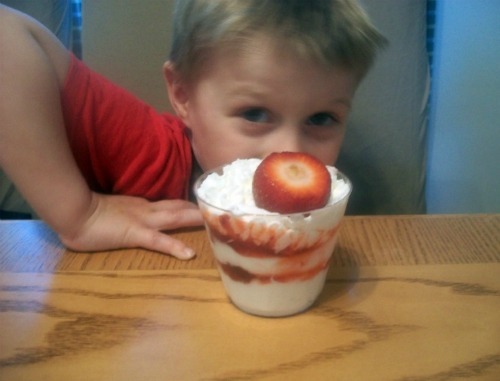 Top each dessert with whipped cream and a strawberry. Serve immediately. I seldom allowed my kids in the kitchen when I was cooking, because I was so afraid that someone would get burned or cut. As a result, cooking for the family was a solitary activity, one that I enjoyed (most of the time). But once in a while, I would get the urge to bake something: cookies, cake, brownies, or bread – and my children were allowed to help. I remember dusting my big table with flour and giving a hunk of dough to each child. Sometimes they would end up with more flour on them than I had put in the bread dough, but it was always a fun experience. And when the bread had baked and cooled enough to handle, I would cut thick slices and lather them with real butter and give them to each child. Outside, there might have been snow and sleet or rain and wind, but inside was a warm kitchen with the lovely smell of freshly baked bread. Remembering this makes me wish that I had encouraged more mom-and-kid time in the kitchen when they were small. Still, we did knead dough and cut Christmas cookies and shake donuts in paper bags filled with sugar. We spent a lot of time eating together. 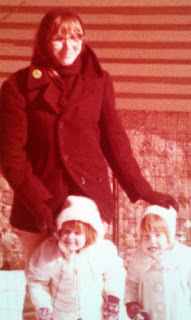 There were Christmas dinners and birthdays, feasts with our friends with multiple children, picnics and camping trips. They ate Cheerios from highchair trays. They learned to eat “one more pea than you are years old” even though at least one of them gagged on peas. They thrived, and grew, and managed to develop their own tastes – tastes that are not much like the food they grew up with, but which are uniquely their own. That last bit of sentence reminds me of how different the foods they ate when they were younger and under my roof were from the foods I grew up with. My father had some strange quirks when it came to food. He believed that tomatoes were poisonous; after all, they were related to the deadly nightshade. He ate raw potatoes, and he salted everything. He wouldn’t eat anything mixed together, which means no casseroles and no mixed vegetables. And (unbelievably) he wouldn’t allow rice or spaghetti on the table. Every night we had a piece of meat (pork chop, steak, hamburger patty, chicken leg), a baked potato, and a (canned) vegetable. 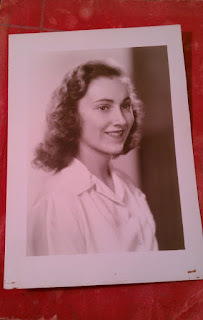 On Sundays Mum would make special meals: fricasseed chicken, pot roast, pork roast. She had a signature salad that I thought the height of sophistication: take a leaf of iceberg lettuce and top it with one pineapple ring. Put a dollop of mayonnaise on it, and voila – Mum’s salad. And on Saturdays, no matter where we lived, we had the traditional Maine Saturday supper: hot dogs, baked beans, and homemade biscuits. 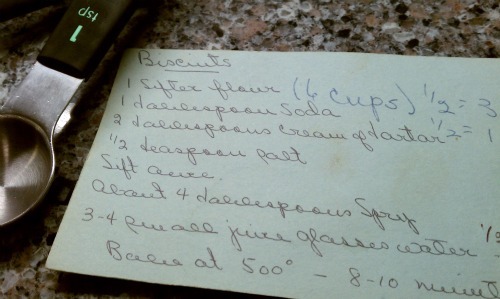 My mother’s biscuits were probably the only good food she made, if I can step back and be objective about her cooking. The biscuits were just standard-recipe baking soda biscuits, but they rose so high and were a lovely, dappled brown when cooked. We put real butter on them, and occasionally added raspberry jam. She used to give me my own piece of dough and let me cut biscuits out; they were always lumpy and uneven, but I enjoyed making them. I guess I’ve come full circle, and rambled a lot, but the point is that I hope that my children remember something good about my cooking, and that it ties in with their knowledge of how much I loved them when they were little (and still do). I’m sure that my mother loved me, though she was always exasperated when I played with the dough (it makes biscuits tough). If you’re reading this and you have children that you cook with, let them make a mess. Give them gooey dough to play with. Cover them with flour. Laugh and smile and make sure you eat everything that looks good to you: memories are made of this. Add shortening and mix with a fork until mixture resembles coarse crumbs. Add ½ cup water and mix gently just until dough can form into a ball, adding up to ¼ cup more water as needed. Turn dough onto a lightly floured surface and gently roll out to ½ inch thick, being careful to handle as little as possible. Cut with round biscuit cutter or the rim of a drinking glass. Bake on ungreased baking sheet 8-10 minutes until puffed up and golden brown. Serve immediately with plenty of butter. Lately I have wanted dessert every night. After a while, even the Skinny Cow Cookies N Cream ice cream sandwiches weren’t doing it for me anymore. I wanted cake. Light, fluffy, and preferably very easy to make. The most fun part was cutting the recipe in half because, come on, two people trying to watch their calories do NOT need eight pudding cakes, even if the cakes are under 200 calories each. Plus I only had six custard cups, and of those only four are pretty. Decision made. The most amazing part of these cakes is that somehow in the cooking process, the meringue-y cake gets all fluffy and baked while this lovely gooey almost lemon-curdy liquid collects in the bottom. It’s an amazing flavor and texture combo. Stay tuned; I plan to try my own adaptation of this recipe to make chocolate pudding cakes. Mwahaha! Preheat oven to 350 degrees F. Coat four 4- to 6-ounce (1/2- to 3/4-cup) ovenproof ramekins or custard cups with cooking spray; place in a large deep roasting pan or baking dish. Put a kettle of water on to boil for the water bath. Whisk 6 Tbsp granulated sugar, flour, and salt in a medium bowl. Make a well in the dry ingredients. Add milk, lemon zest, lemon juice, butter, and egg yolks. Whisk until smooth. 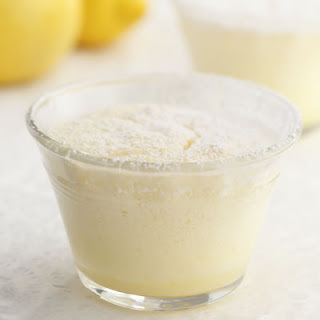 Beat egg whites in a mixing bowl with an electric mixer on medium speed until soft peaks form. Gradually add the remaining 2 Tbsp sugar and continue beating until stiff and glossy. Fold the egg whites into the batter. Evenly divide among the prepared ramekins placed in the roasting pan. Place the roasting pan in the oven and carefully pour in enough boiling water to come almost halfway up the sides of the ramekins. Bake the pudding cakes until golden brown and the cakes have pulled away slightly from the sides of the ramekins, 25 to 30 minutes. [Mine took more like 35.] Transfer the ramekins to a wire rack to cool for 15 minutes. Dust with confectioners’ sugar and serve warm or at room temperature. My first real paycheck job was at Twin Pines Camp when I was in high school, but my first job that didn’t involve making campfires and going on nature walks was behind the deli counter at the Moravian Book Shop in downtown Bethlehem. I LOVED that job. I learned so much about food! Daily I learned life-altering lessons – What flavors work best together? What is quiche? How are cappuccinos made? Is there anything in the world better that a great balsamic vinaigrette dressing? At least weekly I would help myself to a spoonful (or more) of one of the deli’s signature salads: the citrus barley salad. A delightful and unexpected combination of pearl barley, cinnamon, mandarin oranges, honey and walnuts, it is the perfect side dish for a sandwich or a sweet, healthy bite for dessert. Today I live almost 2,800 miles from the Moravian Book Shop, and I dream about that barley salad. My first attempt to recreate the recipe was surprisingly on point! Here, for your snacking enjoyment, is a little piece of my culinary past. In medium saucepan, bring water and salt to a boil. Add barley and cook over low heat 40-50 minutes until water is absorbed and barley is firm yet chewy. Transfer cooked barley to a medium bowl. Add remaining ingredients; toss to combine. Add more honey and cinnamon to taste. 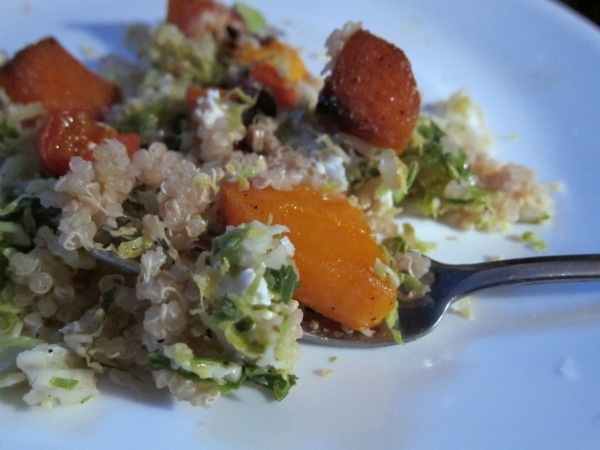 Cool salad to room temperature, then cover tightly and store in the fridge for up to a week. Serve cold or at room temperature. Food poisoning is no fun, man. I was reeeaaallly sick for a good solid week and am still waiting for my stomach to calm down. Soup is just about the only thing that has sounded good this recovery week, so I’ve tried a couple recipes that are easy, mild and delicious. Here’s my own hack recipe for sweet potato and butternut squash soup. You could easily add carrots, herbs – any number of other ingredients – but I used what I had on hand. I imagine this would make a great fall dinner party starter, but paired with a homemade biscuit it was great for my sensitive tummy! In a heavy-bottomed soup pot, heat oil over medium heat. Add onion and brown, stirring frequently, five minutes or so. Add diced potato and squash to pot. Cook, stirring frequently, another five minutes. Stir in ginger, garlic and spices; cook until fragrant, two to three minutes. Add broth to pot, lower heat to medium low, and cover. Allow to simmer for 20-30 minutes, until veg are very tender. Remove from heat. Using an immersion blender, puree soup until smooth. Serve immediately with crusty bread or biscuits, or cool completely before stowing in the fridge for an excellent lunch tomorrow. Our Independence Day ritual usually features a trudge to the beach, a flag football game, and too many cheese curls. We grill hot dogs, light a fire if we’ve been lucky enough to score a fire pit, and have some s’mores. Of course the day starts with packing the cooler, prepping the meat and veg for the grill, and lugging it all out to the car… then lugging it all across the sand … and of course lugging it back to the car and back into the house at the end of the night. This year, I wanted no lugging. I wanted no grill cleaning. I wanted no sand in my shoes. But you know, I still wanted me some s’mores. So I pulled out a trusty recipe from middle school Home Economics – no-bake oatmeal cookies – switched out the oatmeal for graham crackers and marshmallows, reduced the sugar to bearable, and voila! The perfect end to our non-BBQ July 4 feeding extravaganza. Put graham cracker pieces and marshmallows into a large mixing bowl. Set aside. Lay out a long piece of waxed or parchment paper on your counter. In a 2-quart saucepan, melt butter or margarine over medium-low. Add sugar, milk, and cocoa, stirring gently; bring to a boil. Remove from heat. Add peanut butter and vanilla to saucepan; stir gently until mixture is smooth. Allow to cool, stirring frequently, for five minutes. Drop cookies by heaping tablespoon (I used the tableware kind of tablespoon, rather than the measuring kind) onto wax paper. Allow to cool completely until fully set, 20 minutes to an hour. Store in airtight container, separating layers of cookies with wax paper, in a cool place (fridge or freezer work great) for up to a week. Good luck not eating all of them immediately! Alright, so eggplant isn’t your favorite food. You kind of don’t like the texture. It bugs you that it’s slimy sometimes and spongy other times, and both at the worst of times. Why use it at all, really, when there are so many other wonderful foods out there, especially to use in a dish like this where eggplant is the wrap? Why not wrap with pasta? Or zucchini? Or wonton wrappers? Or… pasta? Well, will you trust me on this one? Give eggplant a chance. Joe loves eggplant, so I’ve made a resolution to learn how to cook it. After 11 years of cooking for him, I’d say it’s about time. A friend from work gave me several bunches of fresh herbs from his garden this week, so those make an appearance in this dish as well. Side note: how wonderful it is that backyard herbs last so much longer in the fridge than the ones you buy in the supermarket! Oh, and another thing about Joe. He’s one of those people who just will not tolerate lactose. No dairy for him, no sir, except when he’s feeling especially indulgent and self-destructive. So a dish like this is ideal for him (and also for Lisa! Hi Lisa!) so he can get his eggplant fix and also his Italian food fix without the… indigestables. So. Forget your preconceptions about this intimidating aubergine nightshade. Go on and give eggplant a chance! Measure two tablespoons of oil into a large skillet and set the heat to medium. Working in batches, lightly brown the eggplant slices, turning to cook the second side until easily pierced with a fork. Add more oil to the pan as needed. Set cooked slices aside. In same skillet, cook the onion over medium-high heat until softened. Add chopped zucchini and stir in 2 tablespoons of water to loosen any bits of onion stuck to the pan. Cook until the liquid evaporates again, then stir in 2 more tablespoons of water. When the liquid has evaporated, add the spinach, herbs and seasonings. Stir in the flour and cook 2 minutes. (At this point I felt the mixture was too dry, so I added another 2 tablespoons or so of water before I turned off the heat. Go with your gut.) Set mixture aside to cool. 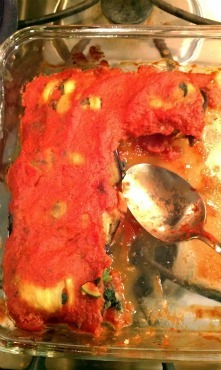 Pour ½ cup of marinara into the bottom of a square baking dish. Assemble the rollatini: Place a spoonful of the spinach mixture at one end of each eggplant slice and roll up the slice around the filling. Arrange rollatini in a square baking dish, seam-side down. Top with marinara sauce. Cover and bake for 20 minutes or until heated through. Every now and then I’ll discover an ingredient that I simultaneously desire and fear. It looks so beauuuuuutiful and deliiiiiicious in those food blog photos… but I have no idea how to cooook it or let alone pronouuuuunce it. Step one: Phonetics. Keen Wah. Kate shared a recipe that was at once intimidating in its unusual ingredients and enticing in its use of the aforementioned desired/feared ingredient. I was on the phone with her the whole time I chopped, cooked, assembled and ate. What a support system! I’ve since made this on my own half a dozen times, so I’ve made a few tweaks to my taste. There is nothing here to fear. I promise. Toss cubed butternut squash with 1 Tbsp oil and roast in 350 degree oven for 20-30 minutes until golden brown and cooked through. Toss halved grape tomatoes in with the squash 15 minutes before squash is done. Over medium heat in a large sautee pan, cook shallots and mushrooms in remaining oil for 3-5 minutes until soft, then add shredded Brussels sprouts and vinegar. Cook until sprouts are wilted and mixture is fragrant and browning. Scoop half the warm quinoa, half the roasted squash, and half the sprouts mixture into a bowl, top with half the crumbled goat cheese and avocado. Save the other half for lunch tomorrow. Disclaimer: These cookies do NOT contain groundhog. One of my favorite and most maddening coworkers of all time, Dean Bartholomew, was originally from Punxsutawny, PA, home of Phil the Goundhog and ground zero for the nation’s annual Groundhog Day weather report. Dean is hands-down The Best Proofreader I’ve Ever Met and has great lessons to teach us all about the benefits of saving money by eating lunch at the sample counters at Sam’s Club and refrigerating one of your bogo Burger King breakfast sandwiches for tomorrow. I believe he also owns a mansion and a yacht. His wife Linda contributed this recipe to those collected by other staff members at my surprise wedding shower in 2000. Bless them both for thinking to share this novelty with me! In a small bowl, sift together flour, salt, soda, baking powder and spices. Set aside. In a large bowl, cream butter and sugar until fluffy. Blend in molasses and egg yolk. Stir in flour mixture and combine well. Form dough into a ball, wrap in plastic wrap or waxed paper. Chill for 1 hour or longer. On a sugar-sprinkled board or counter, roll out chilled dough a small amount at a time, to 1/8 inch thick. 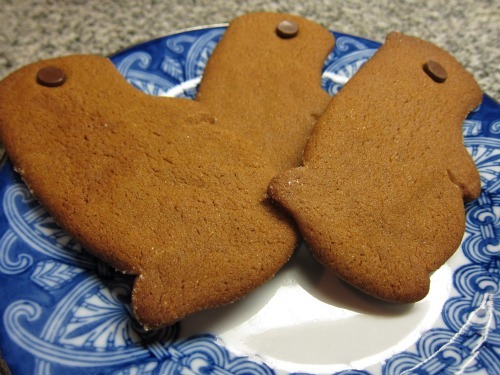 Cut out cookies with a lightly floured groundhog-shaped cutter. Place cookies on a greased or parchment-lined baking sheet. Brush cookies with slightly-beaten egg. Decorate with raisin eye, buttons, etc. Bake cookies 8 to 10 minutes. Cool slightly before removing from baking sheet, then transfer to wire rack to cook completely.